It’s great to know that not only does SM inspire people to build awesome cars, but it also gives shops like SR&C a platform to showcase their amazing talents. As for that inspirational Mustang, it belonged to Neville Brodie and was featured on the cover of SM, Dec ’06. “It was a turquoisey-green one, and I remember it had cross-bracing under the bonnet,” Antony explains. “I saw that car and thought: ‘Man, this guy knows how to put a car together.’” Of course, Antony’s talking about SR&C’s Shane Rowe, and he has nothing but great things to say about him. When it comes to the direction of a build, one thing that’s very important is that the workshop and the client are on the same page. That was definitely the case with the relationship between Shane and Antony, and it’s apparent in the finished product. Whereas most people would start off with a car then go shopping around looking for someone to build it – and quite often getting put off by how much it was going to cost – Antony did it the other way around. He talked to Shane first, got an idea of the cost involved, how long it would take and the process, then went on the hunt for a car. The only thing that was below par with this build was the condition of the original car. It was complete and running, but was pretty stuffed; about the only thing left of it now is the internal skeleton. Every single panel on the car was replaced with reproduction parts, which might sound drastic, but it’s a lot easier than trying to repair panels that have copped 40 years of abuse. The whole floor was also replaced and in the process the transmission tunnel was refabricated to be central in the car. 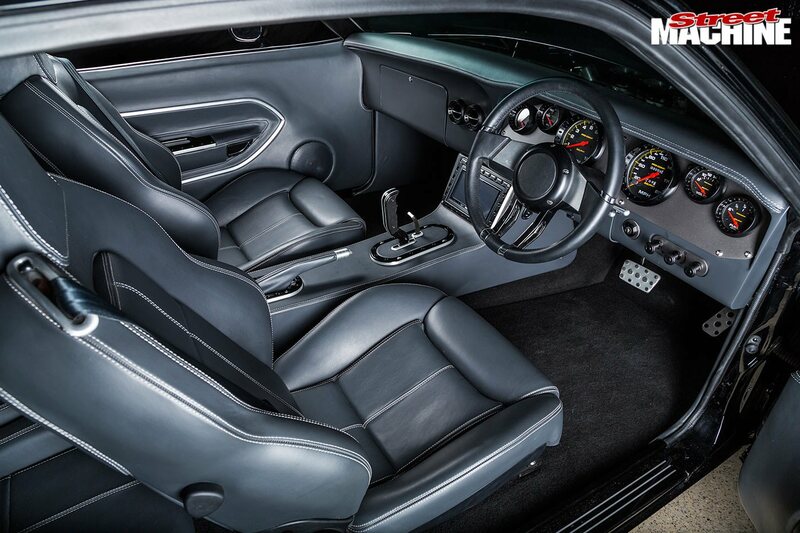 Most US cars have the engine shuffled over to the right-hand side to make room for the steering and brakes on the left, but of course, that becomes a real pain in the arse on a right-hand-drive car – especially when you’re trying to stuff a giant Hemi in the engine bay! 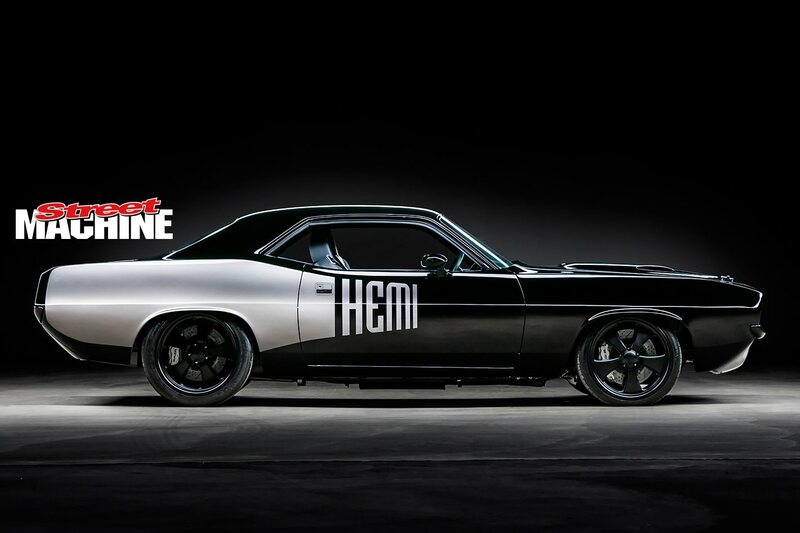 Not just any old Hemi either. 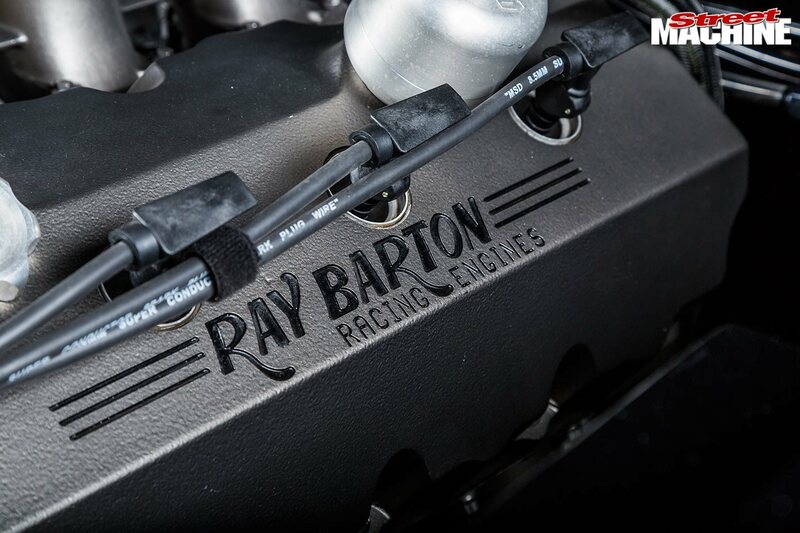 It’s the biggest, baddest, naturally aspirated Hemi in the Ray Barton Racing Engines catalogue. 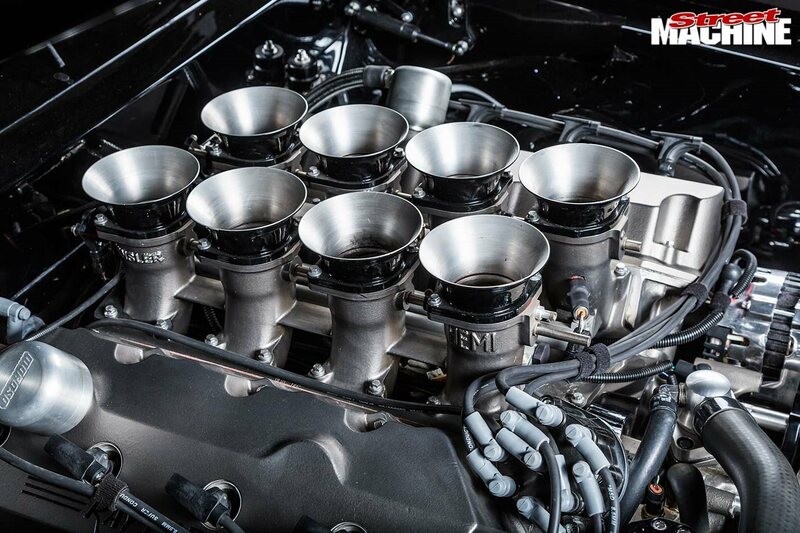 Measuring up at 604ci thanks to a 4.56in bore and 4.625in stroke – the stock 426 was 4.25 and 3.75 – it’s filled with Diamond pistons, a Chrysler 4360 steel crank and I-beam race rods measuring up at 7.1in long with a .990in Chevy journal size. With big cubes you need lots of air, so the Stage V heads are filled with 2.375in and 1.9in valves to make sure there’s plenty of airflow. 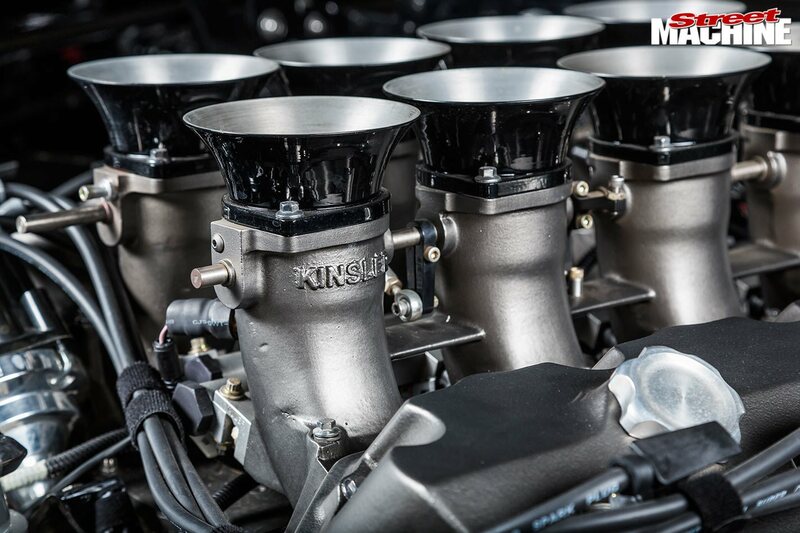 While it’s tough to beat a blown Hemi, that really wouldn’t have suited the style of this build, so instead, Antony opted for a Kinsler eight-stack EFI set-up that fits neatly under the stock bonnet. While the scoops on the bonnet were originally just for looks, Shane opened them up and made them functional to get some air – and a few sneaky peeks – into the intake system. Getting the gasses out required some more masterful fabrication in the form of custom headers with massive 2.25in primaries and twin 3in pipes, all done in-house at SR&C. All that grunt needs a rock-solid driveline and Antony didn’t skimp on that either. There’s a Mega Torq 727 Torqueflite with a Gear Vendors overdrive behind it, which heads back to a nine-inch filled with a Strange 3.9:1 centre and 40-spline axles. 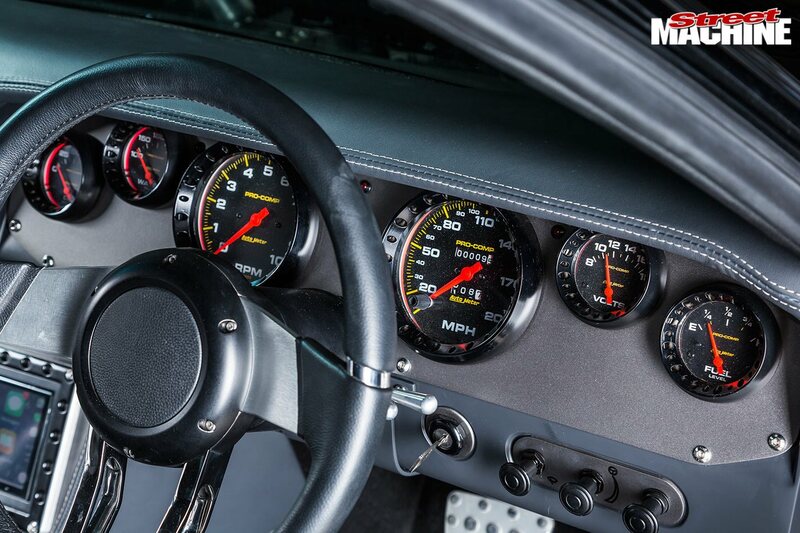 A quick glance at the driveline specs might make you think this car was built simply to go fast in a straight line, but that was never the plan. There’s nothing left of the factory torsion-bar and leaf-spring suspension, with Shane opting for a much more modern offering from XV Racing Products. 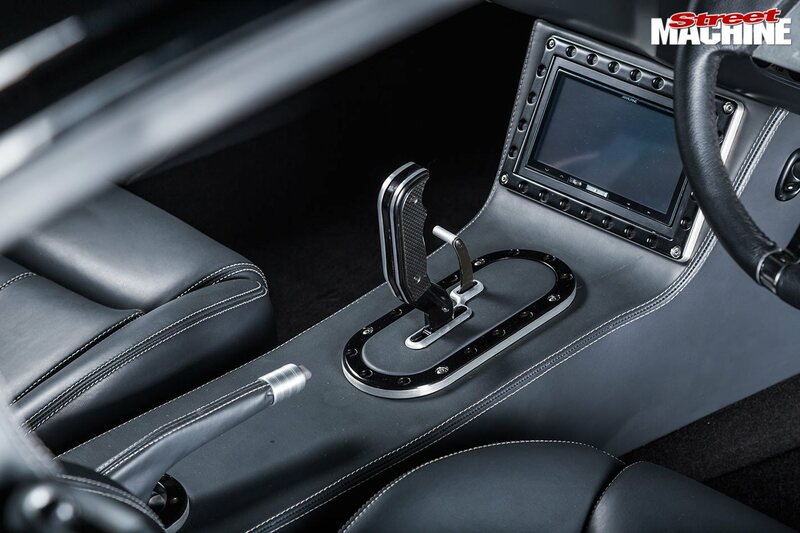 “They base all their stuff on the C6/7 Corvette platform,” Shane says. “Their work and their ethics and the whole set-up are really top-notch. They’re all ex-GM engineers and the like doing it, and are renowned for building high-end track suspension. There are others that sit the car really low on its guts, but they don’t really work well.” In the rear, SR&C fabricated a four-link with a Watt’s link, and the car is hauled up by six-piston Baer brakes on 14-inch rotors. Of course, those brakes aren’t worth a damn if there’s no rubber on the road, but that’s another thing this car’s not short of. 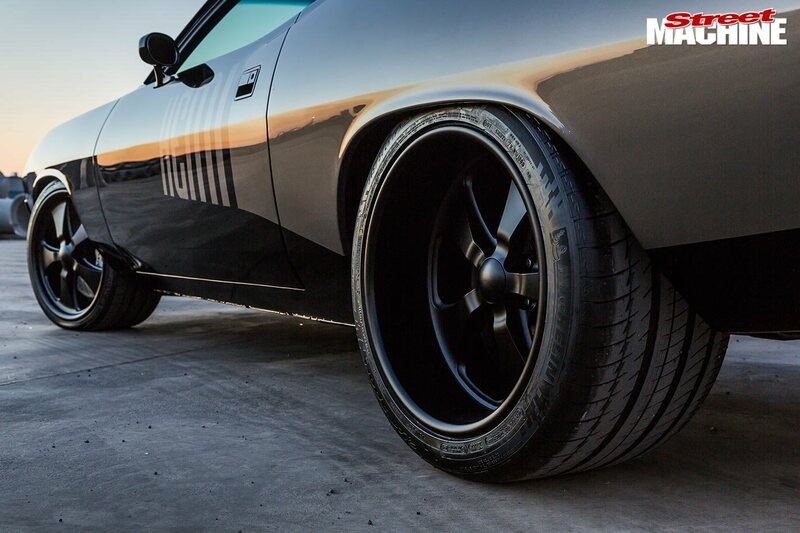 The 19×10 and 19×12.5 Budnik Fontana rims are wrapped in 275/35 and 345/30 Michelin Pilots. The perfect bodywork is highlighted by the ink-black paint, which is broken up by a tweaked version of Plymouth’s billboard graphics. Ordinarily, these were a sticker and you could have them in either black or white, but Ryan Carter at Stylemaster Designworks – who also did the original concept artwork for the car – came up with a slightly larger version that has been sprayed in a custom-mix grey with a touch of gold pearl – hence the difference in colour in some of the photos. 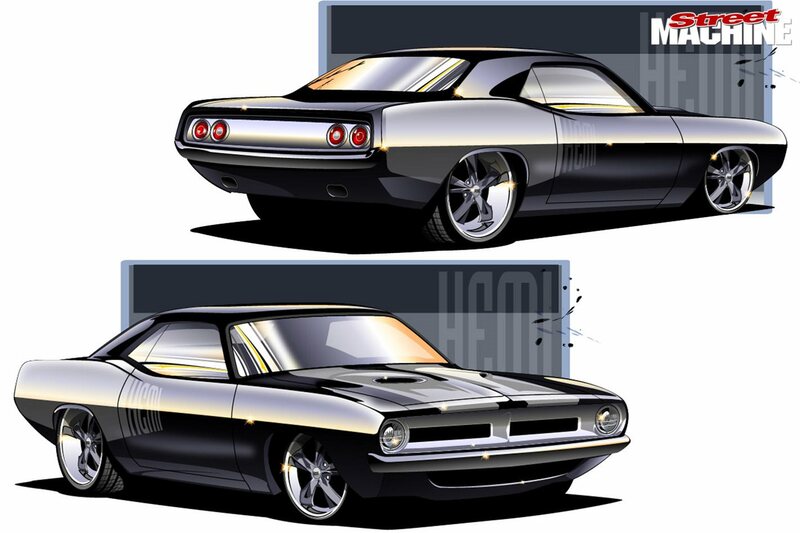 Shane admits that he thinks every car should be painted black, but over the eight-year course of the build, there was some discussion of painting it another colour, possibly even a lime-green. 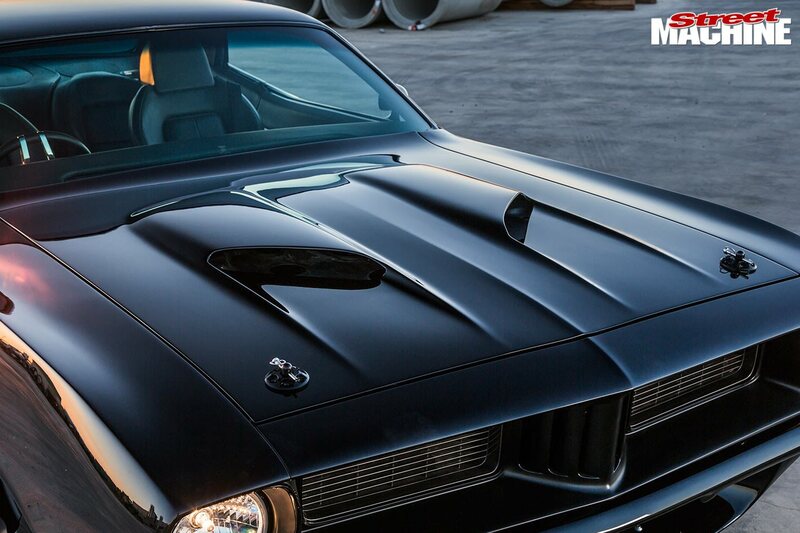 In the end though, they stuck to the original plan: “It had to be black, that was the look, like a Mopar version of Mad Max’s car,” he says. 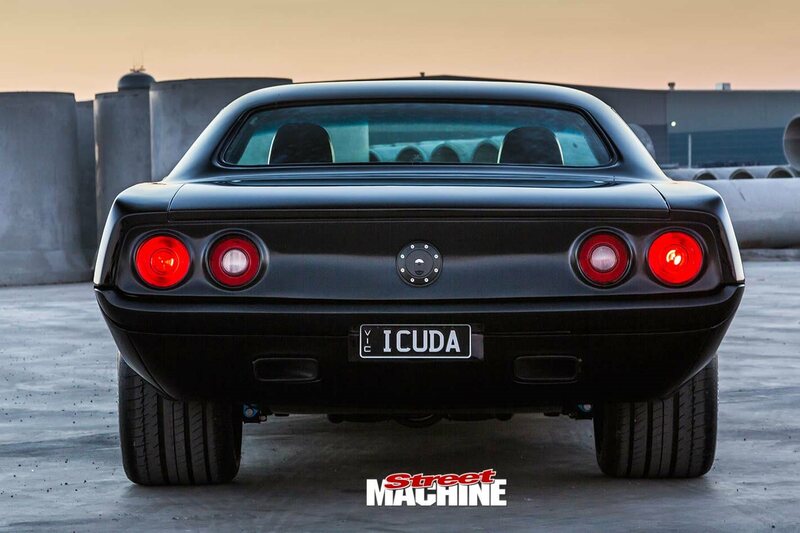 Now that the ’Cuda is finished, to say that both Shane and Antony are thrilled with it would be an understatement. “When I met Shane for the first time we had the exact same vision for the car, so it was a pretty easy build in that way,” Antony says. Shane agrees. 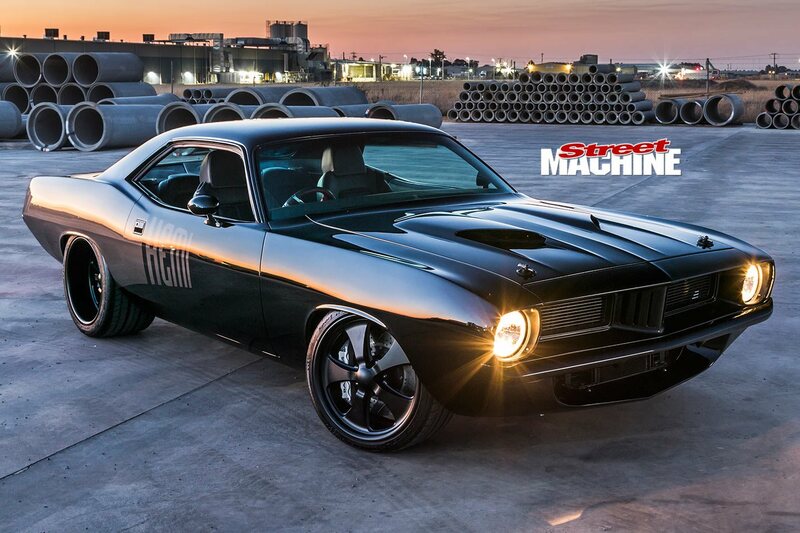 “From the artwork we had Ryan from Stylemaster originally do [above], the finished car turned out perfect,” he says. “Nine times out of 10 that doesn’t happen. But we stuck to the plan right through, and that’s the secret to the car – it came out how everybody wanted it.